Yesterday for lunch Adelaide Food Central were invited to the opening of Beach Bum Summer Pop-Up just off of Rundle Mall. With their original store in North Adelaide, this pop up addition will be open for 3 months. I was very excited to attend this event, as I have always been a fan of their famous poke bowls and fish tacos. The concept of Beach Bum is of a Hawaiian cuisine with some Japanese influence. The pop up store is a fantastic way to be able to enjoy the amazing cuisine that Beach Bum has on offer in a take away atmosphere. We were treated to a wide range of menu items which all disappeared rather quickly. 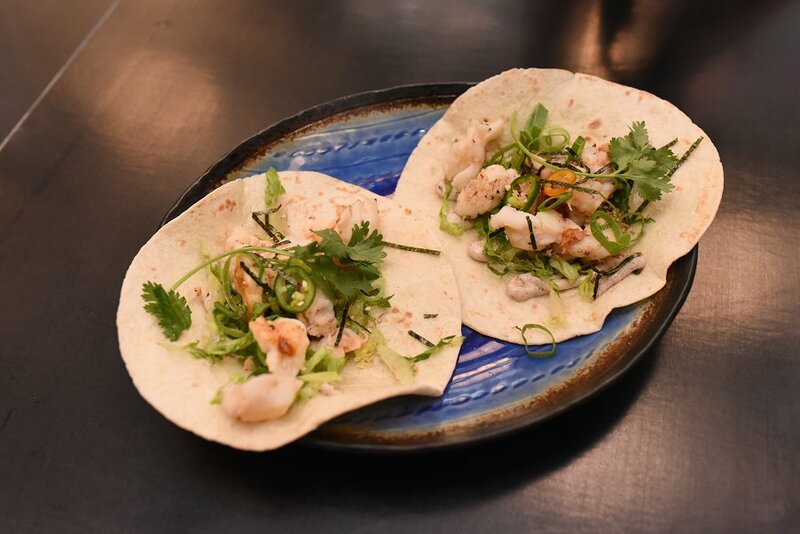 Luxe Lobster Taco – seared lobster, toasted flour tortilla with shredded cos lettuce, nori mayo and fresh lime. Everyone on the table agreed that this was one of the favourite dishes that we sampled. The beautiful fishy lobster paired perfectly with the crunchy lettuce and lime. The nori mayo helped to give the lobster that extra creamy element. I would go back time and time again just to try this delicious soft taco. 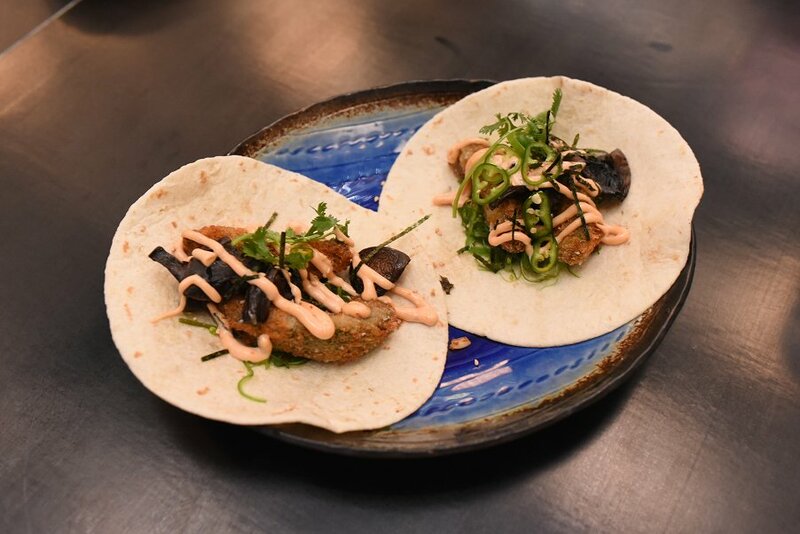 Panko Avocado – crumbed avocado, apple soy, seaweed salad, banana pepper and chipotle mayo on a flour tortilla. I have actually sampled this dish before from their North Adelaide store, and once again it is a favourite of mine. I love how well the avocado has been crumbed to give the dish that crunchy element. Seaweed salad is also a weakness of mine, and the squeaky green sea vegetable paired perfectly with the crispy avocado. The combination of apple soy and chipotle mayo helped to give the taco that extra zing of flavour. 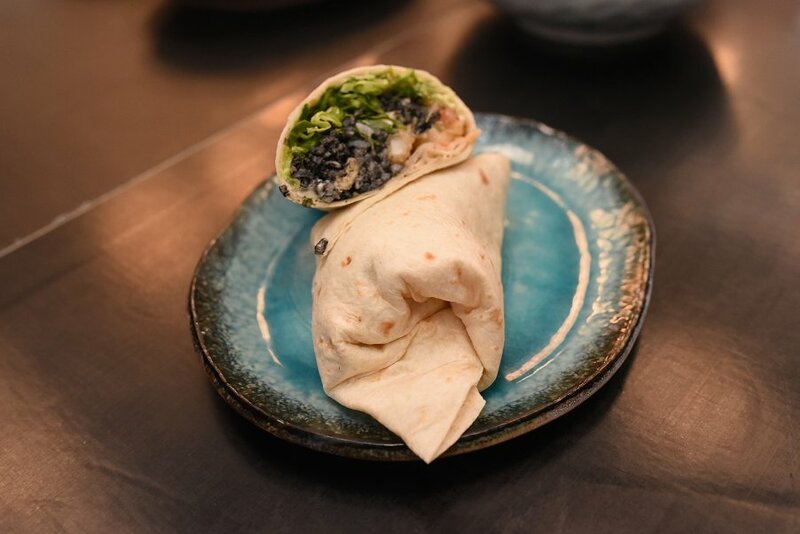 Mandarin Duck Burrito – flour tortilla wrap with roasted duck, hoisin sauce, avocado mash, sushi rice, tomatoes, orange and bok choy. Have you ever had peking duck pancakes? Well this burrito is your Hawaiian style peking duck pancake and boy, it was good. As always the hoisin sauce worked perfectly with the subtle duck flavour. What I really enjoyed about this dish was the addition of the orange. The sweet juicy fruit paired well with all the other elements of the dish and gave the burrito a point of difference. 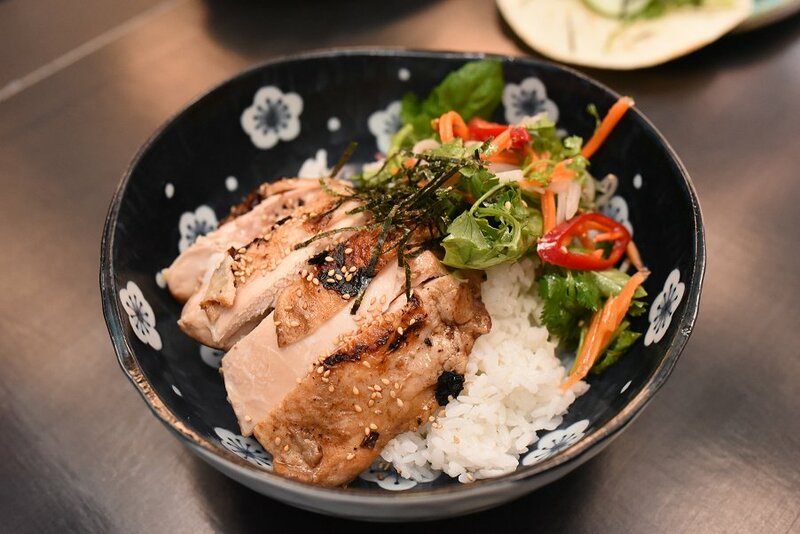 Hawaiian Chicken Rice – grilled chicken with lemongrass, chilli and lime with coconut rice served with basil, pickled carrots, cilantro, daikon and red chilli salad. I have never been a huge fan of chicken dishes, as I find them rather boring and sometimes lack flavour. But this dish was absolutely delicious, and something I would order time and time again. The grilled chicken had been seasoned perfectly with lemongrass and an almost sweet and sticky glaze. The coconut rice was slightly sweet which also worked well with the flavours from the chicken. All the condiments that were served with the chicken rice gave that fresh and crunchy element. Miso Eggplant – eggplant and miso dressing with brown rice, sautéed mushrooms, daikon and pickled carrot. This vegetarian option found in the Japanese bowls section, is a fantastic addition to their menu. Salt and pepper eggplant has always been a favourite of mine when ordering at an Asian restaurant. The eggplant was cooked well so that the crispy outing could be enjoyed in conjunction with the other condiments. The sautéed mushrooms paired well with the pickled carrot and the brown rice. Salmon Poke – with edamame beans, green onion, toasted sesame, nori, avocado, seaweed salad and pickled ginger. 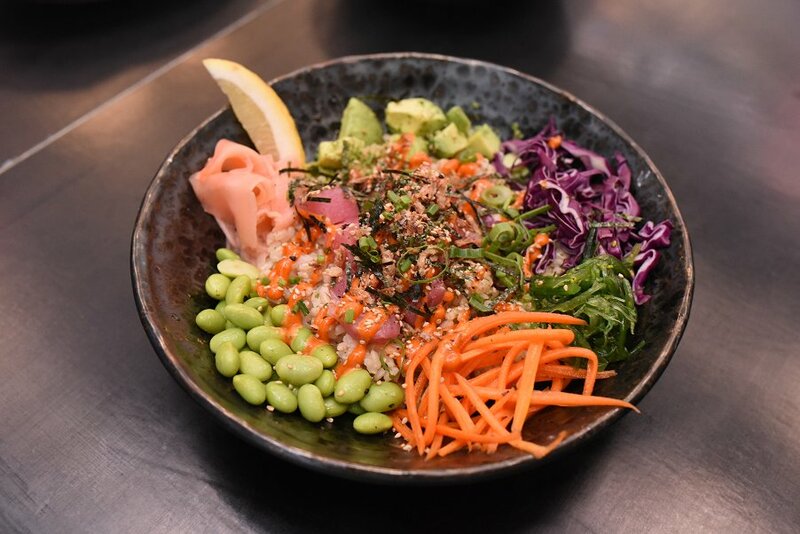 Did you know that Beach Bum were the first restaurant to introduce the Poke bowl to Adelaide? Now it is becoming a cuisine that individuals eat from time to time. Poke bowls are so fresh and full of many nutritious and delicious ingredients. Each and every element of the bowl produced a different texture and flavour. The fresh vegetables and rice complimented the subtle flavour of the salmon. We would love to thank the staff at Beach Bum for introducing us to their delicious menu. Special thanks to Grays PR for inviting us along to attend this event. Beach Bum Summer Pop Up store are open from Monday to Friday 11.30am-2.30pm.